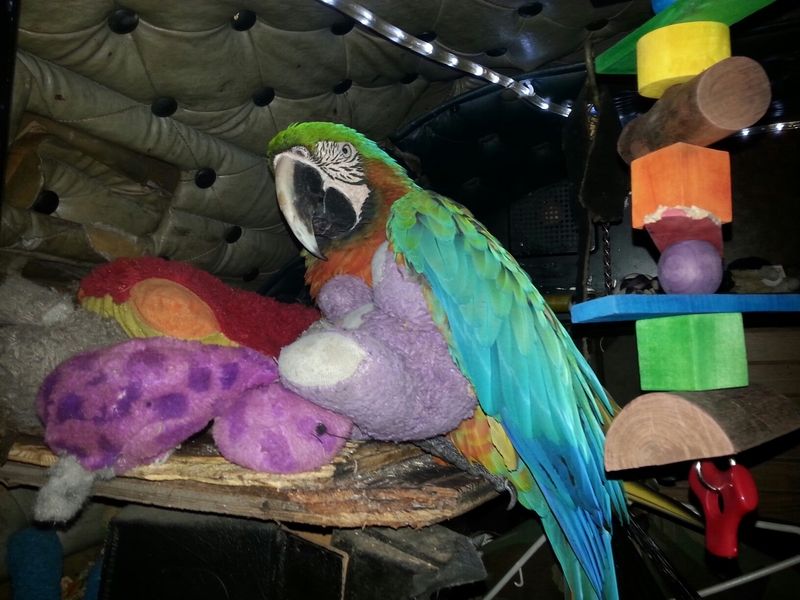 St. Patrick’s Day is the birthday of a very special Harlequin Macaw named Muggsy. Happy 32nd Birthday, Muggsy! 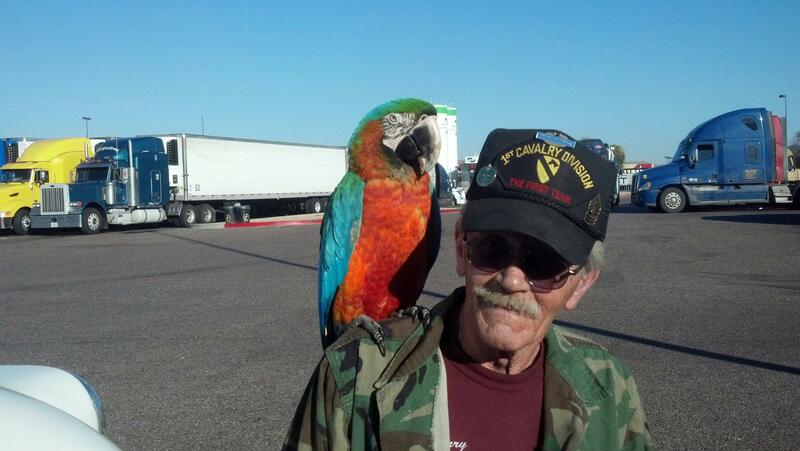 Muggsy travels in a big rig with his owner, Larry whom my husband Greg met at a truck stop in Texas. Greg mentioned to Larry that I’m a blogger and asked if I could call him, and he agreed. Fascinated about this beautiful bird my husband met, I contacted Larry and learned about the amazing Muggsy. “Larry, does Muggsy scream at you every morning to wake you up? Muggsy eats fresh vegetables, and Larry makes homemade (at home and in the big rig) meals for him. Larry has a full-size refrigerator and a microwave in the truck. He sees that Muggsy gets healthy meals. The bottom part of macaws’ beaks are hollow inside. They lap water, eat the skin of nothing, and like to eat bone marrow. Every day Muggsy gets an ear of corn, a four-egg omelet, and fresh vegetables. He likes sweets (eats an oreo cookie a day). “Will Muggsy receive birthday treats?” I asked Larry. Thank You for Visiting Kitchen Hospitality! Macaws are such beautiful birds. They live a long time, too. 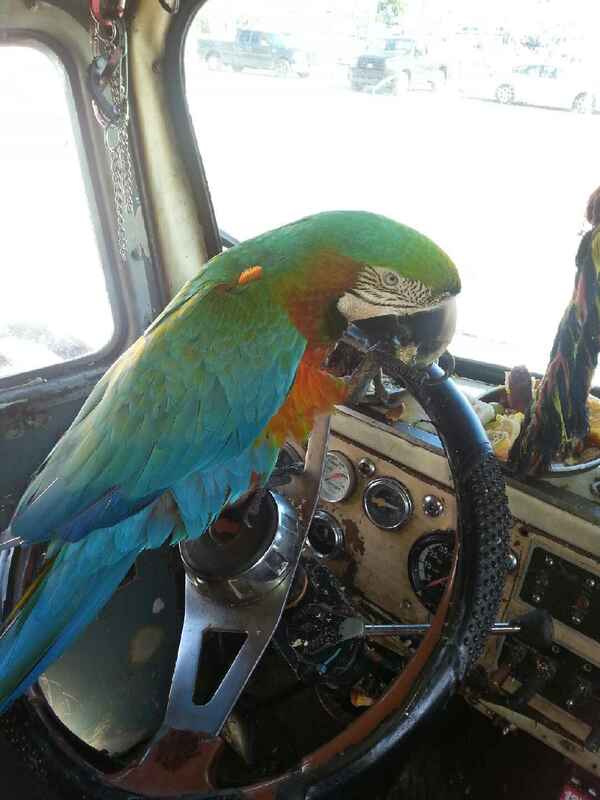 A bird is probably the perfect pet for a truck driver, too. Muggsys owner feeds him very good and nutritious food. I told him it’s no wonder they live so long. What a great post and a great bird! Hope you have a very special week and thanks so much for sharing with Full Plate Thursday. Miz Helen, thank you. Isn’t that the prettiest bird? I just loved getting to talk to his owner, Larry, about all the different foods little Muggsy eats. So fascinating. I loved reading your post about Mugsy! I just love birds of any kind. I raised two cockatiels….. “Muffin” lived to be twenty -five and ” Cookie” was twenty- seven when he passed this past January. Suzy, thank you! Both my grandmothers also had birds. It fascinated me as a little girl to watch them carry the little birds on their shoulder as they walked around the house and talk to them. I thought they were cockatiels, but they were small birds. How big were your cockatiels?